This casserole was downright delicious. I found this recipe on another blog, Healthy-Delicious, and the author compared the flavors to a big order of nachos you’d order at a casual dining chain restaurant. I think she’s almost right, but this tastes even better! The chili oil makes this pretty spicy (in a good way) so if you like things milder you could use mild salsa instead of medium to tone it down a little. 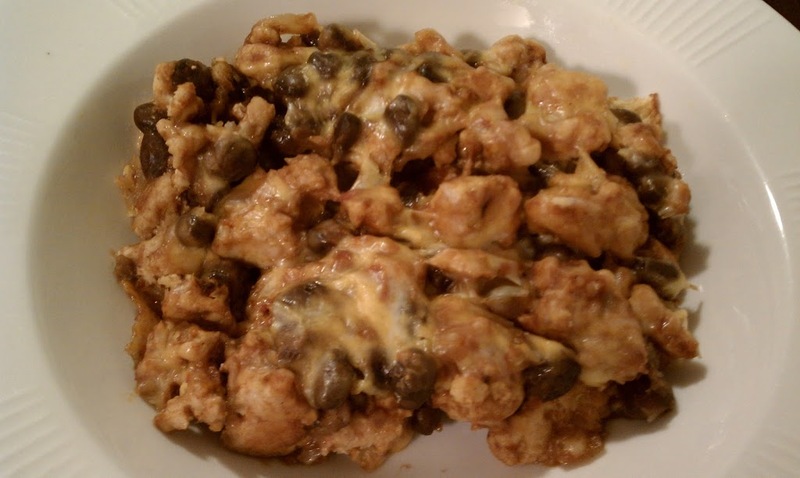 The original recipe was made with ground chicken, so you can use that instead if you prefer. If you like Mexican-American food, you will love this! Break up the tortilla chips into bite sized pieces and use them to line the bottom of a 9×13 baking dish. Evenly spread the meat mixture over the chips and then sprinkle cheese over the top*. Bake for 20 minutes. looks delicious! just added it to my menu for the week! This is so good! If you have kids, they will beg you to make it again! This was really good! Next time, I will omit the chips on the bottom- we ate it with more corn chips. Also would be really good in a taco shell or in a flour tortilla. YUM! The whole family enjoyed this one, kids included! Thanks for posting. Awesome, thanks everyone! Glad you liked it. Reena, let me know what you think! Made this for dinner tonight, big hit even with my picky brother who hates casseroles, he had 2 servings..thanks for all the great recipes. This was really yummy! I left out the tortila chips so it was only 5 points and then at some on the side. I did add ff sour cream and some wholly guacamole too. My husband thought it was great as well. We love finding non diet tasting recipes while we try to stay on track with our weight watchers. Thanks, Laura! I’m so glad you and your husband loved it! I’m excited to make this! My husband and I went to 2 stores looking for chili oil and had no luck. We bought some diced green chilis to add. I hope this doesn’t effect the flavor to much! Thanks for all the great recipes!!! Made this tonight. Loved it!!! Do you have the nutritional information for this dish? I’d love to try it, but am counting calories/fat versus doing weight watchers (for budget purposes). I started providing full nutrition information for my recipes at the beginning of the year, but it’s taking me quite a while to go back through and add it to all my older recipes. If you want to NI for this recipe before I get it, I use the free recipe builder at myfitnesspal.com, so you are totally welcome to enter the ingredients there! I made this tonight and it was beyond delicious. I omitted the corn chips and added corn, black olives, and petite diced tomatoes to add a little more. Topped it with FF sour cream and Wholly Guacamole – delish! My boyfriend and I can’t stop raving about this recipe and we’re so glad we have leftovers. Thank you for your WW friendly blog and delicious recipes!! I really want to make this dish… but I cant find chili oil. Is there another name for it. or a substitute? Emily – I love your website! I have made several of your recipes and there is none that we don’t like. 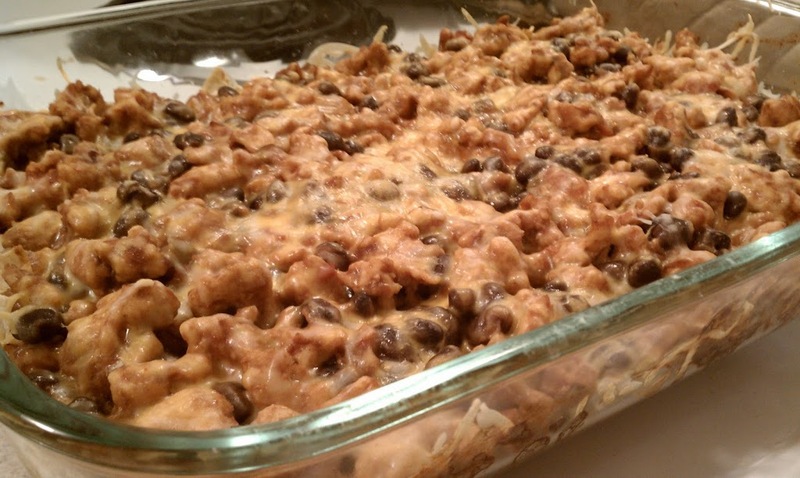 Last night we had this Taco Casserole Bake. Everyone loved it. Thanks for helping those of us on WW stay on plan with your delicious recipes! Hi Emily! I found your blog in a google search for GOOD food that weight watchers doesn’t hate. Yes, really. 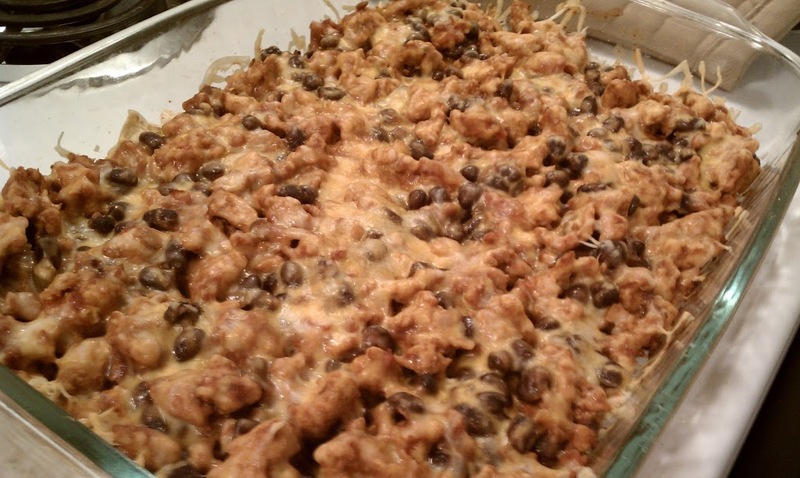 I made the taco casserole bake last night and it was a HUGE hit (except with the 10 year old who, oh my gosh mom, can’t be compelled to eat anything remotely spicy). Thanks to all the really yummy looking recipes on your site, I believe this WW thing might work after all. Thanks! I plan on posting a link back from my blog http://fridaynightgirl.wordpress.com. Have a look! Emily, do you think leftovers could be frozen and reheated? or would it be best to cut recipe in half for just two people. Thank you!! !- Krista R.
This was really good. It’s a keeper! I used 1 pound canned white meat chicken, shredded, instead of turkey. Do you add water with the taco seasoning like most packs say, or does the salsa replace the need? It was SO, SO good! I am glad I found the chili oil to add. I think that was the key ingredient. Thanks so much. Looking forward to trying more of your recipes! Do you know that calories per serving for this recipe? Would it be possible to get the nutritional information for this recipe? This recipe was perfect for my super picky kids! We had some fritos in the house so half the pan had scoops and half was fritos. (Yes, this was a ploy to get my kids to try more than one bite.) I did add a few more beans as my family loves beans. This was perfect for a quick, filling meal! Hello! I am just wondering how much spice the chili oil adds? I love mexican food, but am a little sensitive to really spicy things. Thanks! It definitely adds flavor and spice but I wouldn’t say this dish is overly spicy. You can substitute canola oil if you’re nervous about it. Does anyone know the SP for this? Thanks so much for this recipe! I make it every week to take to work for lunches! It’s a lifesaver on my WW plan!